Hello Everyone! Normal desert weather is here and I hope it is here to stay. Mornings are spent outside digging weeds, clearing space around the house so I don`t stumble on a rattlesnake. No, they don`t always rattle as a warning. Most of the Green Mohave we encounter are aggressive and they don`t buzz. The venom is a neurotoxin, similiar to that of a cobra. That is why we are very careful. The nights are still cold making the critters move slower in the morning till they can warm themselves in the sun. We don`t have a dog door anymore. Snakes figure them out real quick! I needed two sewing machine covers and decided this would be a great way to use some of my scrap fabric stash. This is an easy pattern, quick to sew. 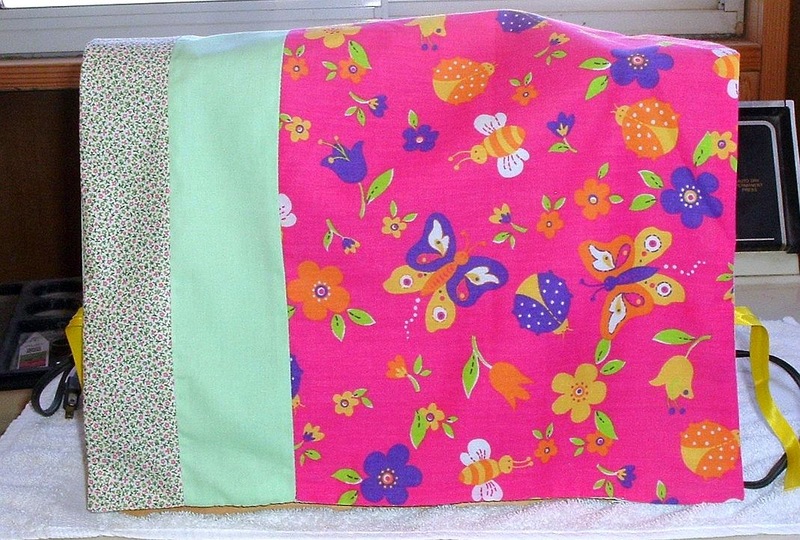 I picked out three different cotton fabrics for the outside and the lining. I used ribbon seam binding for the ties. The pattern link is here This pattern is from a great blog called Sparkle Power. Lots of tutorials and other fun information! 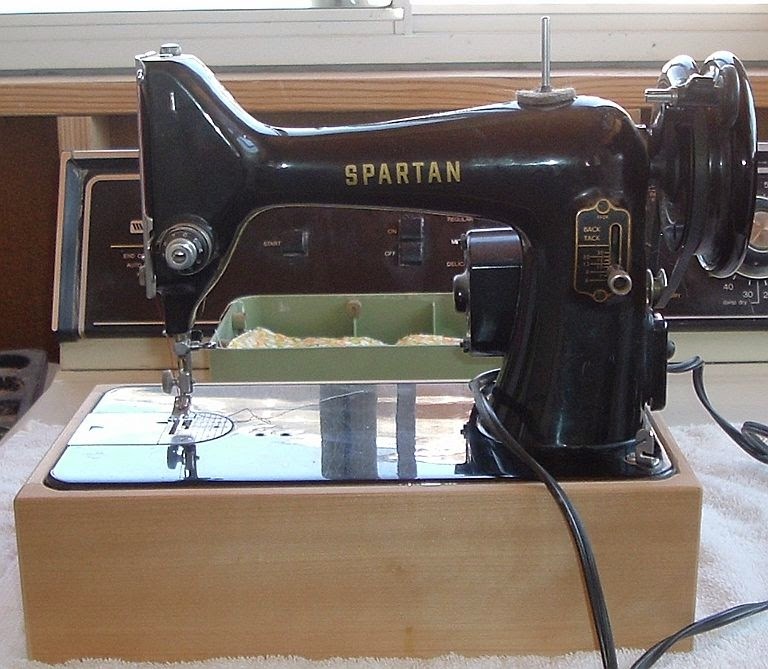 The machine is a late-fifties Singer Spartan made in Canada. It`s a 3/4 size. My husband made the wood base. Spartan`s don`t come with a case and the plastic base or box this beauty sat on is cracked so hubby made me a new one. If you see a Spartan with a case, it is after market. The best straight stitch machine I ever had! My Singer 99 desperately needing a cover. I live on a dirt road. Dust is Everywhere! I love old Singer`s! The finished product! The colors are a little off . No more dust! That`s it for today. The sun is up, husband and dogs need to be fed and wash hung on the line. Thank you for visiting. I appreciate it! Just got the last of wash out on the line. I just love it when I can hang it all out as it not only smells good but it is free drying!! Chilly here today compared with yesterday but it is beautiful all the same!! Have a Great Day my Friend!! Your Singer Spartan is adorable. It looks sturdy and down to business. Nice dust cover, too - great way to use up some fun scraps! Catherine! So good to hear from you...stories of snakes...not so much (especially coming through the dog door....ewwwww!!!) Love your dust cover ~ I need one of those, and have lots of old vintage linens that have holes and stains...guess what they will become?!! Thanks for the idea :) enjoy your week!! Happy you stopped by! I really do adore that sugar bowl in your last post. Glad you shared it. Have a great weekend. I so need to make a couple for my machines. Oh that is very pretty, Cathy! My sewing machine was one of the first 'portables' so it has its own case, and when I've finished sewing for the day, the machine always has its cover on. We don't get as much dust as you, but I still cover everything when I'm not using it, even the keyboard of my computer. I put a large doiley over the keyboard of Ken's laptop, as he leaves it open all the time, and I stopped advising him long ago to shut the lid down when he's finished. I never thought to cover my keyboard. That`s a fantastic tip. I`m going to start covering everything! And I have plenty of doilies to do it!